Many children have terms of endearment for their parents and grandparents. While these names may not make sense to an outsider, to those inside the relationship those names evoke the fondest of memories. One such term that is used in the New Testament is “Abba” and it means “daddy”. The term Abba conveys a sense of utter trust and intimacy between a child and a father. So much so that it is even carried on into adulthood. It was in the Garden as Jesus prayed on the night he was betrayed, “Abba! Father! All things are possible for You; remove this cup from Me; yet not what I will, but what You will.” (Mark 14:36 NASB) In His hour of deepest sorrow and emotional pain, Jesus cries out to the Father with the most intimate name he knows – Abba. While His Father is high and exalted above all the universe, He is also “Daddy”. I read the story of a tourist in Israel years ago who was walking with his tour guide in a residential neighborhood. As the walked, they saw a man park his car in front of a house. Immediately two small children ran out the front door to welcome him home from work, crying out “Abba! Abba!” until he hugged and kissed them and carried them back into the house. It is that same spirit that we have as Christians in our hearts, because God is now our Father and we are his children. Paul wrote about that relationship in letters to Rome and the churches in Galatia. Think about that! We now have the privilege of using the intimate name that Jesus himself used when addressing is Father! And because of the love relationship we have with God, we can call Him Abba because we have been brought into the family as adopted children. We don’t have the boldness of a trusted advisor or even a daily servant. We have the same boldness to enter into His presence as the King’s children have. It is not based on talent, experience, or status. 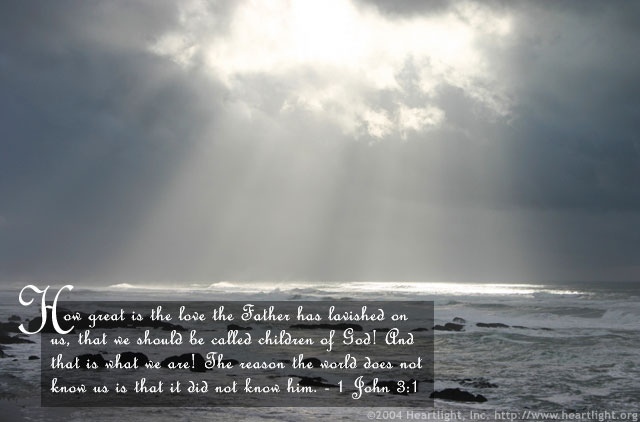 We can come to our Abba Father at any time simply because He is our Daddy and we know how much He loves us! Have You Prepared A Room? Just like with his disciples today, Jesus desired a special place in which to commune with us and participate in a memorial feast. Our hearts must be a room prepared for His presence. Our hearts and minds need to be focused on Christ and what He has done for us. This is not something that will just happen on its own. We have to be intentional about it. By our preparation we show that this is quality time, where we can slow down and meditate on Him and the sacrifice of love that was given for us. With the preparation completed, Jesus was able to take time to establish the feast that would symbolize the sacrifice that is the basis of our fellowship together. He would show them symbols that would soon be a weekly reminder so they would never forget. And so it is fitting that the church, brought together by the covenant pictured in the bread and fruit of the vine, would also be born in an upper room. The disciples returned as directed to Jerusalem to wait for their enduement with power from on high. So there they were in the upper room in one accord, praying for the promised Holy Spirit. This same Spirit was the one that the Lord had promised would lead them into all truth (John 14:26). “When the Day of Pentecost had fully come, they were all with one accord in one place. And suddenly there came a sound from heaven, as of a rushing mighty wind, and it filled the whole house where they were sitting.” (Acts 2:1, 2 NKJV). What had begun I. A room now filled the entire house, and would soon fill the earth. The truth would go forth, the Spirit bearing witness with signs and wonders to the authenticity of the message they were bringing (Hebrews 2:4). How fitting that the room that witnessed the establishment of the meal that would serve as a reminder of the covenant we have with Christ would be the place where the church was born and the Apostles would receive the Holy Spirit that would lead them into all the truth that would sustain her. And that truth is with us today, in the New Testament that was written through them. So as you prepare your inner room, like that first upper room, for the Lords Supper, meditate not just on the new and everlasting covenant in His blood, but upon the communion that we have in that covenant and the Apostles doctrine that we have received in the New Testament for us today. 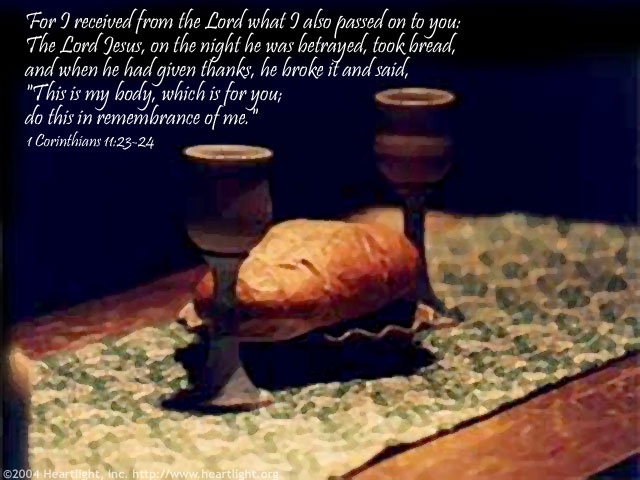 Make your heart furnished and ready for communion with Christ.